Spicerhaart Part Exchange & Assisted Move has won a contract with innovative house builder NU living. 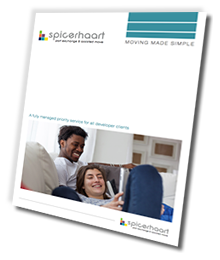 Spicerhaart Part Exchange and Assisted Move (P/X&AM) has enjoyed its most successful quarter to date, thanks to a 33% increase in business. When pensioners stand to lose £29k downsizing – could assisted move be the answer? Almost half of all pensioners are considering downsizing to release equity from their homes – that’s around 5.7million people - but according to research will ‘lose’ £29,000 on average doing so. Leasehold does have issues, but could banning it create other problems? There is no justification for ground rents to escalate the way they have been, but could banning leaseholds create a double-tier market trapping leaseholders in their properties? Could assisted move be a better option for pensioners who wish to downsize?